Today was a whirlwind day for me. I began the day with a looming appointment on my calendar for noon: Marine Corps Marathon registration. This race has been on my mental bucket list for some time and I added the 3/27 appointment to my calendar, hoping that I could get in. Get in, you ask? Yep. The 2012 Marine Corps Marathon registration sold out in less than 3 hours. This year I knew I had a small window of time to try to get a bib and I was hoping that it could happen for me. My efforts were foiled when the supporting registration site crashed, leaving me feeling disappointed and frustrated. I had even got so far as to enter in my credit card number and press “register” when the site crashed on me again. And here’s where social media saved my day, more specifically a new friend I met via Twitter and the Cleveland racing community. Emily (who I have only ever met and run with once!) used her computer magic to register for me. I can’t explain how much her generosity of time and effort meant to me. She knew how badly I wanted to run this race, and, since she had already sealed her registration by participating in another MCM event, she took time out of her day to help me get in. Now, the only problem? My husband was doing the exact same thing for me at home. Sooooo, this lucky girl got two registrations. Thankfully, the MCM and their partner website (who I am graciously trying to not offend in this post!) recognized that many, many people did just what I did and they will refund us one of the registrations. I’m impressed with the Marine Corps Marathon for recognizing the problems that all of their runners encountered and the apology they posted on their Facebook page. I’m confident that they will have the registration issues worked out before next year. In the mean time, I’m so excited about this race that I can barely contain myself. Thankfully, I got to spend the rest of my night with other runners who could appreciate my excitement. The Official Blogger group for the Rite Aid Cleveland Marathon met for dinner and discussion at Bar Louie in Cleveland. I had the chance to meet the other members of the blogging group and to hear from the PR team that has been posting my blogs and helping to get the race organized and ready for all of us to run. 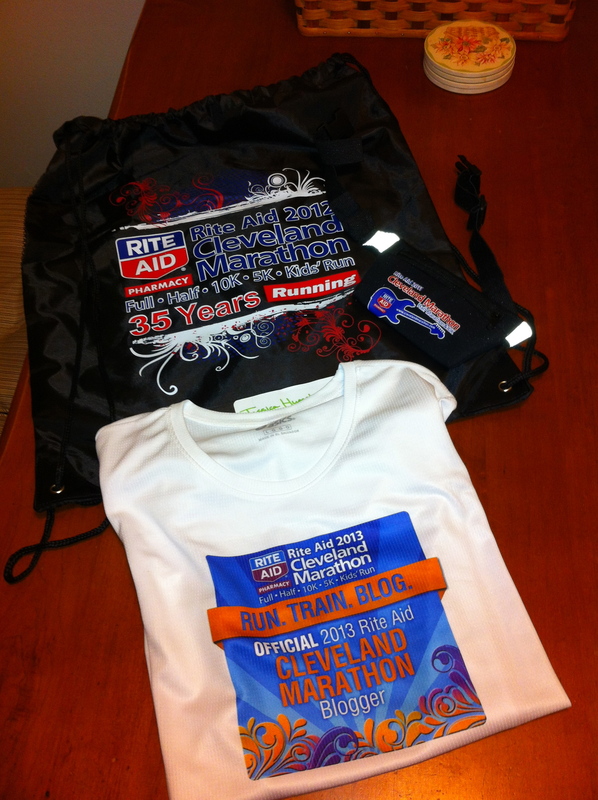 The night began with Joan, Rite Aid race coordinator, surprising us with some running gear. Check it out! Gear bag, racing belt and Official Blogger Racing Shirt! It was great to finally meet in person the many people that I had been reading about and corresponding with on our blogs and Twitter pages. We even got to Google chat with Mark Lindsay, a blogger from Texas that will be coming back to Cleveland to run this year. I had a great time and am thankful to the Rite Aid organization for the many adventures this blogging opportunity has given me. 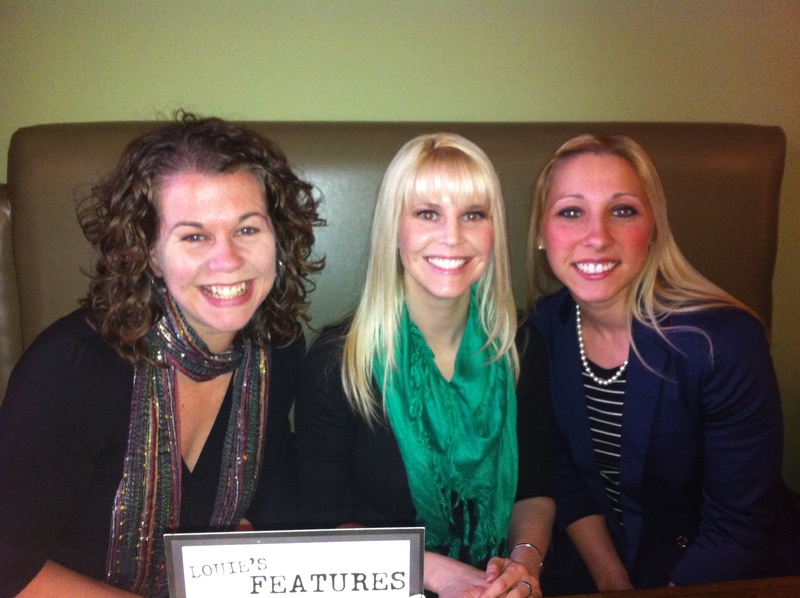 Official Blogger Jess Sandwich: Me, Stephanie and Jessica B. So, getting to the point of this post……social media has improved my running life. Becoming a part of a community of runners has made me a better athlete and a happier person. I am a natural introvert-I hang back, I watch what everyone else is doing, I observe, I write, I’m pretty terrible at small talk. Running appealed to me because it wasn’t a team sport-I didn’t have to reach out to anyone else in order to put my shoes on and get out the door. But, in reality, days and weeks and months of hitting the road solo can be lonely and tiresome. Connecting to other runners on Twitter, Facebook and my blog has given me support, encouragement, and a sense of belonging in a sport that is normally very solitary. Thank you again to Emily, the Rite Aid Bloggers and the people who stop by to read every day. I’m so glad that you got in! I can’t wait for it! !